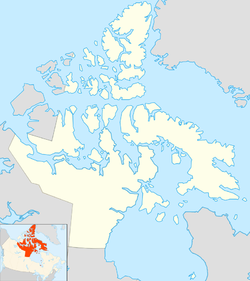 Native Point (Inuktitut: Tunirmiut or Tuneriut) is a peninsula in Kivalliq Region, Nunavut, Canada. It is located on Southampton Island's Bell Peninsula at the mouth of Native Bay. It is notable for being the location of an abandoned Sadlermiut settlement, currently an archaeological site. The Sadlermiut settlement, situated on the west side of the point, was abandoned after the Sadlermiut became extinct during the winter between 1902 and 1903. Now a notable archeological site, it is referred to as "T1" because of the Inuktitut name, "Tuneriut", for Native Point. T1 is the largest Sadlermiut site on the island. The material culture of the Sadlermiut were limited to chipped stone tools and various manufactured organic artifacts. Among the artifacts found in the site were human figurines called aarnguaq, which was probably used for a healing ritual. This indicates that the Sadlermiut were shamanistic. In addition, multiple human remains were found on the site. Merbs and Wilson grouped the burials intro three series, each with chronological significance: the "village" graves, which were thought to be the oldest, "peripheral" burials located northeast and southeast of the settlement which were given of intermediate age, and a series of "meat-cache" graves, suggested to primarily represent casualties from the 1902-1903 epidemic which decimated the Sadlermiut population. ^ Eskimo Prehistory. Taylor & Francis. 1964. p. 146. ^ "History". edu.nu.ca. Retrieved 2009-05-05. ^ Ryan, Karen; Young, Janet (2013). "Identification of a probable aarnguaq in a Sadlermiut grave from Native Point, Southampton island, Nunavut, Canada". Arctic Anthropology. 50 (1): 22–48. This Kivalliq Region, Nunavut location article is a stub. You can help Wikipedia by expanding it. This article about archaeology in Canada is a stub. You can help Wikipedia by expanding it. This Canadian ghost town-related article is a stub. You can help Wikipedia by expanding it. This page was last edited on 3 March 2019, at 16:24 (UTC).